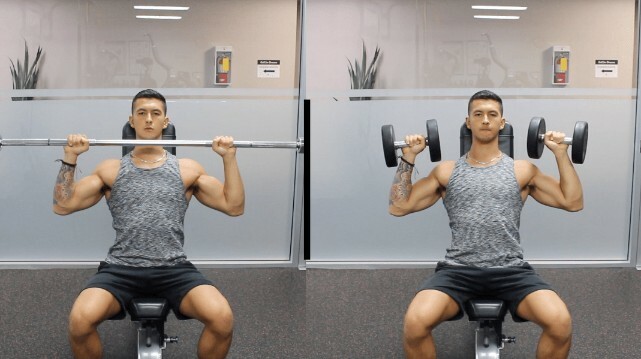 If you want to learn whether barbells or dumbbells are more effective for muscle growth… AND how to apply that knowledge into your own routine, then you need to read this article. When it comes to maximizing muscle growth, there’s no question that you need to prioritize free weights exercises in your routine. But when it comes to your choice of free weight exercises, your left with two options: barbells vs dumbbells. Now although it’s clear that both are effective options to build muscle, what’s less clear is whether one is better than the other in terms of maximizing growth. And to find out, we need to weigh out the pros and cons of each. To start, let’s take a look at barbells. First off, for those who are unaware, as brought to attention by a 2010 meta-analysis by Schoenfeld and colleagues, there’s thought to be 3 main mechanisms of muscle growth. Of these 3 mechanisms, mechanical tension is suggested as being the primary driver of growth. You need to be performing heavy compound movements and getting stronger with them overtime. Which now leads me to the main benefit of incorporating barbell exercises – they generally enable you to maximize mechanical tension to a larger degree than dumbbells can. Reason number 1 is because you’re able to lift heavier weight with barbells compared to dumbbells. 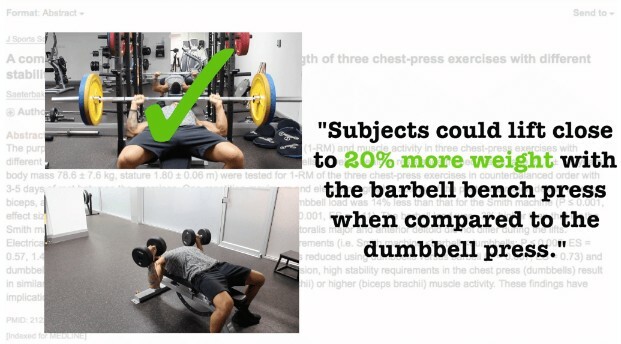 For example, this 2011 study from the Journal of Sports Science showed that subjects could lift close to 20% more weight with the barbell bench press as opposed to the dumbbell press. Similarly, this 2013 study from the Journal of Strength and Conditioning Research found that subjects could lift close to 10% more weight with the standing shoulder press when a barbell was used as opposed to dumbbells. And the reasoning behind these results is probably because barbell movements require less stabilization as you press when compared to dumbbells. The second reason why barbells better maximize mechanical tension is because they enable you to more effectively progressive overload when compared to their dumbbell counterparts. If you’ve reached the point where you’re pushing serious weight with dumbbells, you’ve probably noticed how difficult it is to get into position. You waste a lot of energy before you even perform your first rep. Compare this to barbells, where on the bench press for example all you need is a small lift off and you’re ready to start your set. In addition, barbell movements can be overloaded with just 2.5 lb increments on each side. Whereas dumbbells usually require you to make 5 lb jumps in each hand as you progress. This makes week-to-week progressions run more smoothly and prevents you from reaching strength plateaus too soon. So as you can see, these small yet significant factors enable you to progress faster and more efficiently with barbells compared to dumbbells. And thus overtime leads to more mechanical tension and theoretically more growth. But with that being said, this doesn’t mean you should exclusively stick to barbells since dumbbells do have their advantages as well. As of now it may seem as if barbells take the cake. However, before jumping to conclusions we need to take a deeper look into exactly what dumbbells have to offer. The first and one of their most significant advantages of dumbbells in terms of muscle growth is that they tend to elicit higher muscle activation when compared to their barbell counterparts. For example, this 2016 paper from the Journal of Strength and Conditioning Research found that the dumbbell press consistently elicited significantly higher pectoralis major activation than the barbell bench press. The results from the study can be seen in the graph below. This finding has also been replicated in the past in an extensive EMG analysis by Bret Contreras. He found that both the flat and incline dumbbell press elicited greater chest activation when compared to flat and incline barbell presses. And as for other muscle groups, this 2013 paper found that utilizing dumbbells allowed for more activation of the anterior deltoid when compared to barbells during both the seated and standing press. Thus, this increased activation is something that would likely hold true for most other muscle groups as well. And the reasoning behind it is probably because utilizing dumbbells enables you to achieve a slightly greater range of motion than barbells. Since for example at the top of a dumbbell press you’re able to perform slightly more horizontal adduction than you can when compared to having your hands fixed on a bar. This idea can be seen in the graphic below. 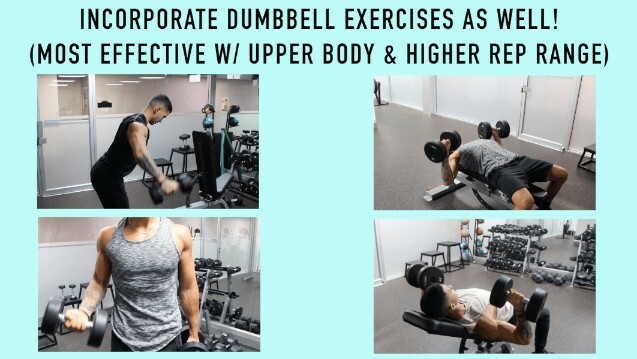 It ALSO enables you to move the dumbbells in a more natural path that best suits your individual body structure rather than being stuck in a relatively fixed path with the bar. Thus, leading to better activation of your target muscle and also often providing a more comfortable press if you tend to experience aches and pains with the barbell. And muscle activation aside, another major benefit of dumbbells that you’re probably aware of is that it can help minimize muscle imbalances. Since each arm is working independently, your body can’t subconsciously favour one side when pressing or curling. …therefore leading to more balanced development in the long run if that’s something you struggle with. Barbells vs Dumbbells: Who Wins? As you can see, both dumbbells and barbells have their drawbacks, but they both have their positives as well. And completely avoiding one in favour of the other means you’ll always miss out on one set of positives. So instead, use a combination of both as this will likely be optimal for muscle growth while minimizing potential imbalances and injury. What I’d first recommend you do is focus your program on lifting heavy with the big compound movements. And this is most effectively done with barbells in order to maximize mechanical tension. This is also especially true when a lower rep range of 4-6 reps and heavy weight for example is employed. Since doing so with dumbbells becomes challenging to balance and stabilize the weight and thus less efficient. But in addition to these main barbell movements, you should also incorporate dumbbell exercises. 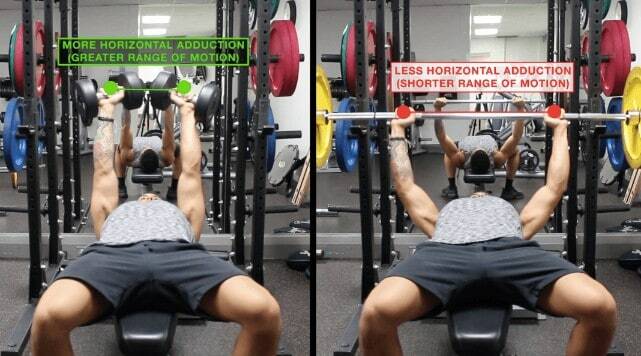 This is particularly important mainly for upper body exercises and when a higher rep range (~6-12 reps) is employed. This not only helps maximize metabolic stress and muscle activation, but also help minimize any potential muscle imbalances and/or injury in the long run. So for example, for a chest or push workout, starting with a barbell bench press in a lower rep range and then moving onto an incline dumbbell press with a slightly higher rep range would be a good way to go about incorporating both. And the same methodology can be applied to other muscle groups as well, in order to ensure that you get the best of both worlds. So as you can see, both is better than one or the other when it comes to maximizing muscle growth. But the key is in how you implement them! Anyways, let me know in the comments if you have any questions that I can help you with. And don’t forget to show me your support by giving me a follow on Instagram , Facebook , and Youtube where I’ll be posting informative content on a more regular basis. Cheers! I have always been more of a dumbbell girl myself but I do like the barbell as well. This really helps me when I plan my workouts. Also makes sense as to why I can go heavier on the barbells then I can on dumbbells. Thanks. What if I do Barbell Bench Press with 4 sets of 8 reps and then Incline Dumbbell Press with 3 sets of 12 reps? Or should I do 4-6 reps is Barbell Bench Press? Depends on your goals and weekly volume! The dumbbells are also better if one works out at home, as they need less space. I believe that using of the dumbbells can often help if we want to conduct the exercises as correctly as it is possible. So, if one does not want to gain a lot of the muscle mass, and works out to keep himself or herself in orderly shape, then the dumbbells are,for me, the clear winner.